Tennessee Trucking Foundation board members voted to support Trucking Moves America Forward, an educational initiative that not only furthers the understanding of the trucking industry but also ignites a passion in others for the work it does, said Tommy Hodges, TTF president. Trucking Moves America Forward, which launched in March 2014 at the Mid-America Trucking Show in Louisville, is an industry-wide image and education initiative informing policymakers and the public about the benefits of trucking to build the necessary political and grassroots support to strengthen and grow the industry. 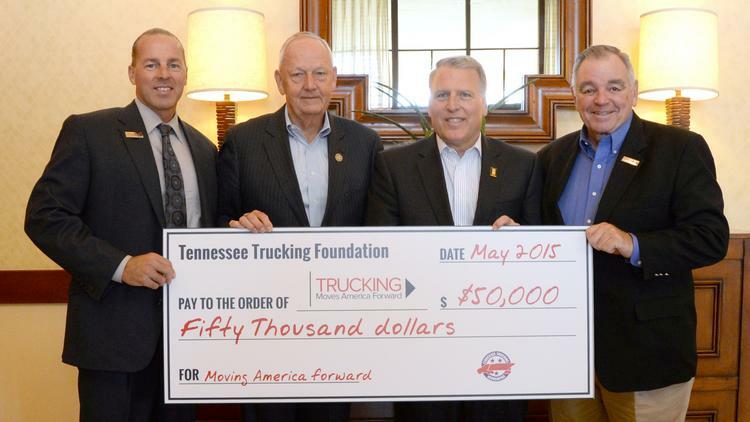 The Tennessee Trucking Foundation announced a $50,000 financial contribution to Trucking Moves America Forward (TMAF) over the next five years. Tennessee Trucking Foundation members of the board voted to support Trucking Moves America Forward and believe the campaign fits seamlessly with their mission. A photo of the donation presentation can be downloaded at the TMAF website. TMAF, which launched in March 2014 at the Mid-America Trucking Show in Louisville, Kentucky, is an industry-wide image and education initiative informing policymakers and the public about the benefits of trucking to build a groundswell of political and grassroots support to strengthen and grow the industry. TMAF has been bolstered by significant financial contributions from the American Trucking Associations (ATA), Allied Committee for the Trucking Industry (ACT I), Old Dominion Freight Lines, Great West Casualty Company, Pilot Flying J, TAEC Region IV, Trucking Associations Executive Council and Jack Cooper Transport. TMAF has also received significant financial support from state trucking associations including Minnesota Trucking Association, Motor Carriers of Montana, New York Motor Truck Association and the Texas Trucking Association. TMAF is also proud to have received strong support from industry leaders such as National Tank Truck Carriers, National Auto Dealers Association and Truckload Carriers Association, and donations from Randall-Reilly, Transport Topics, Owner-Operator Independent Drivers Association, Overdrive Magazine, Commercial Carrier Journal and Heavy Duty Trucking. Today, the Tennessee Trucking Foundation announced a $50,000 financial contribution to Trucking Moves America Forward (TMAF) over the next five years. As the 501(c)3 charitable arm of the Tennessee Trucking Association, the Tennessee Trucking Foundation works to build, shape and protect the industry’s image in Tennessee through highway safety programs, community education and involvement with children’s charities. In 2014, the Foundation published a children’s book, Papa Doug Hauls Strawberries & Smiles, which has quickly become a favorite among the industry’s families and supporters. The 25-page hardcover book tells the sweet story of a big-hearted truck driver, his relationship with his young son, and his commitment to delivering his load safely and on time. Through gentle stories and gorgeous images, the book not only creates a window into the life of a trucking family, it also educates children and adults alike on trucking’s vital role. Papa Doug Hauls Strawberries & Smiles books are a natural extension of the TMAF movement because the story reaches children at an early age to establish the professional truck driver’s place as an important part of American life, and gives the driver a face and a family that young readers can relate to. The Foundation’s contribution to TMAF is primarily funded through the sale of Papa Doug Hauls Strawberries & Smiles books.